Fish Water, aka Nam Bplah, aka Thai Fish Sauce is my newest staple flavor. It's a central flavor in Thai cooking and is used in similar ways to how westerners use salt as a flavoring. I would not say that the two are interchangeable. Fish sauce definitely imparts a flavor to Thai food that cannot be duplicated by just adding salt. I'm not sure where my love of Asian flavors comes from. I started eating sushi with my family when I was very young and I'm guessing it has grown from there. The truth is that I have never met an ethnic food that I didn't like so let's just chalk it up to a love of all ethnic food. When I'm craving Thai food, this soup can be ready in 20 minutes and usually hits the spot. Heat oil in a medium pot and add garlic and ginger. Cook until just heated through and add coconut milk and water. Remove a small amount of cooking liquid to a bowl and stir in cornstarch. Return cornstarch slurry to the pot, add carrots and bring to a boil. Once carrots are just tender, add noodles and cook for 4 - 5 minutes. Add shrimp and remove from heat (shrimp will continue to cook). Stir in lime juice and fish sauce and salt to taste. Divide soup between two bowls, top with scallions and enjoy! I love thai food and shrimp. This looks amazing. I will have to try it soon! I have never really tried anything like this before but I love coconut shrimp so maybe I would like this too! Looks gorgeous! I love the flavors of coconut milk, lime and fish sauce in Thai food. This is definitely soup weather where I live. I'm going to try this right away. I've really never given Thai food a chance. Mainly because I'm not a big fan of heat in my dishes. I have all the ingredients for your soup at home and will have to give it a try. I'm with you in the love of ethnic food. I try to make at least 2 new dishes a month that are something ethnic that we've never tried before. Hi again - I went to my local Asian store to purchase the noodles, but they didn't carry them. Is it a rice or wheat noodle? Can't wait to try this. Hi Cathy! It's a rice noodle. 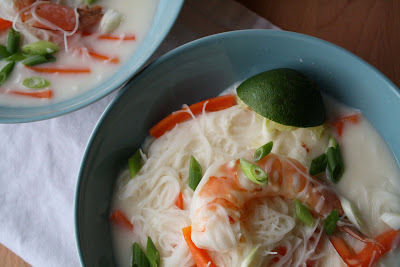 Specifically, they are angel hair rice noodles, but I think any kind of rice noodle would work well. Just go by taste and feel for determining when they're finished cooking rather than the times I provided. Let me know how it goes! I have never tried this with coconut milk before but it always intrigues me when I see it on a menu. Yours looks fantastic! My hubby would love this as well, which means I need to give it a try soon. that looks amazing!!! what a spectacular soup! I love Asian flavors too, and this recipe seems to really capture it. Nice job! Asian soup is one of my absolute staples! I have at least once a week for dinner - and probably a less fancy version twice a week for lunch!! I love thai food! The soup looks fabulous! Yummmmm! I love Thai food (and ethnic food in general, or actually food in general, especially when it's spicy). That soup looks super good. this looks soooo yummy. love thai food, especially coconut & lime (or lemongrass)together. This sounds really delicious and I love the photo. Makes me want to eat some!